Germany has been named as the world’s best place to be a young person. 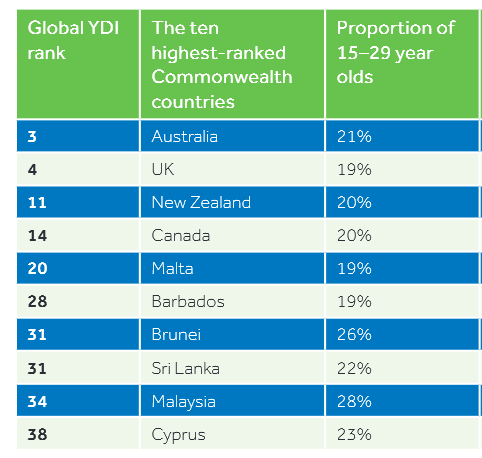 The rankings were listed in the Commonwealth Secretariat’s Global Youth Development Index and Report, which researched and analysed what life is like in the five key areas below for the world's 1.8bn people between the ages of 15-29. 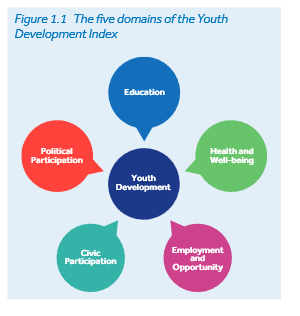 The index looked at 183 countries and of those, 142 recorded improvements in their Youth Development Index (YDI) scores over a five-year period. European countries dominated the top ten, featuring eight times, and included Denmark (2), Switzerland (4) and the UK (5). Only Australia (3) and Japan (10) scored high enough to make the cut from outside Europe. The Commonwealth recorded the highest gains, and, with the exception of Pakistan, every Commonwealth country maintained or increased its YDI score between 2010-2015. So, when ranking the Commonwealth countries Australia tops the list, followed by the UK and New Zealand (number 11 in the global ranking). "As much human development hinges on the fate of the young, and there are more young people in the world today than ever before in history, it is surprising how small and shallow the pool of data on young people still is," said Dr Selim Jahan, Director, UNDP Human Development Report Office. In what is described as a "demographic dividend", the report outlines how the next few decades provide an opportunity for the world to harness the talent of this young generation. 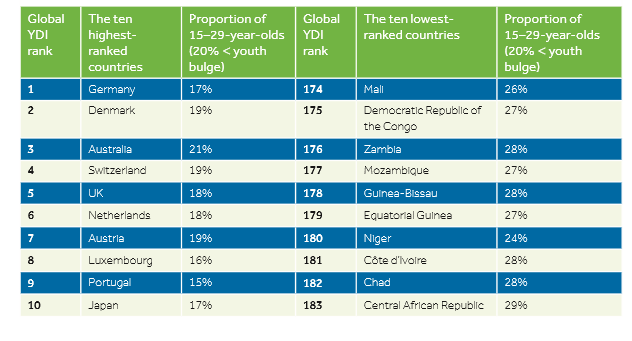 In Sub-Saharan Africa, where despite significant improvements the YDI scores remain lowest, the young population is expected to dominate in just a few decades’ time. Dr Mo Ibrahim, Founder and Chair of the Mo Ibrahim Foundation for Good Governance in Africa, explains: “Africa is a continent of young people…within three generations, 41 per cent of the world’s youth will be Africans.